Alright, I know, it's been a while since I've posted anything. But this was worth waiting for, right?!? Anyway, I've been surprisingly busy doing not much of anything. Seriously, though...Work takes up an amazing amount of time. The precious free time I have is spent cooking, cleaning, reading, or sleeping. The latter is my favorite. I'm still loving my second trimester. I'm feeling great--except for being tired. My only complaint is that my hips are starting to hurt when I'm lying down, which tends to make sleep interesting. All in all, though, things are going well. We've started our birthing classes; in fact we have our next one in a few days. A friend from church pulled together three couples so that we could do a Bradley method class. Since I'd really like to have an unmedicated birth, Bradley really seemed like the way to go. You can check out more info about it at www.bradleybirth.com. So far we like it, though we feel like we're a little more moderate in our views about medical practice than Bradley can be at times. We had our first (and we thought only) ultrasound on Tuesday (10/23). I can't even begin to describe how amazing it was to see our baby on the screen. 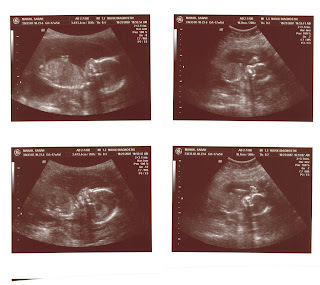 We were a little nervous at first because the baby's position was not optimal for ultrasound--spine toward the "camera." But it didn't take long for her to roll to her side so that the tech could get some good shots of her. Stubborn like both of her parents, she had her legs crossed very tightly and we were about to resign ourselves to not knowing the gender. Thankfully though, our tech was on the ball and when our little girl did a full body stretch the tech got a pretty clear view and declared "it's a girl!" It's so nice to not have to find ways to avoid calling our baby "it" anymore. Ultrasounds are designed to be used for diagnostic purposes, so even though it's fun to find out the gender of your baby the tech has practically a million shots to get of all the major organs and such. The reason I mentioned that we thought that this time would be our only ultrasound is because sometimes even the best of techs miss shots or don't get clear ones. Such is the case for us. Our tech got all four chambers of our baby's heart, but missed a few other crucial ones concerning blood vessels and other heart shots. Since hearts are important, I'm going back in two weeks for more pictures. Woo hoo. At least I'll get more pictures this way. :) I'll also have to go back later in my third trimester for a third (and hopefully final) ultrasound. They discovered that I have a low-placed placenta which could either be really troublesome or no problem at all. The last ultrasound will determine whether or not my placenta (which is currently really low in my uterus but not covering the baby's exit route) will allow for natural vaginal birth. If the placenta is too low it could get in the way and make it essentially impossible to have natural labor and delivery. If this is the case, then I'll have to have a C-section. I know that for some of you this may be too much information, but I share it so that you can be in prayer about it. I really would like to deliver naturally and the thought of a C-section both scares and disappoints me. The prayer request is twofold: first, that as my uterus grows the placenta would move up with it and; second, that if a C-section is necessary that God would give me peace about it. I really do dread a C-section almost more than anything else birth related. I almost cried when my midwife told me about the situation. All of this to say, prayers are much appreciated! That's all for now, I guess...check back soon (I promise) for some long awaited pregnancy pictures. Congratulations Mahars!! Baby girls are a blessing! We will be praying for you...Dr. Jason says "most likely your placenta will shift and you will be fine". Prayers and Blessings!